All eyes are on Bonhams’ upcoming Fine Wine and Whisky Auction in Hong Kong this month, as the auction house is to offer two rare Macallan whiskies from 1926; shortly after the pair broke a world record for the most expensive whisky ever sold at Dubai airport retailer Le Clos for a staggering US$600,000 a bottle. The price achieved at Le Clos last month also surpassed Bonhams’ high estimate of HK$4,600,000 (US$586,000) a bottle. 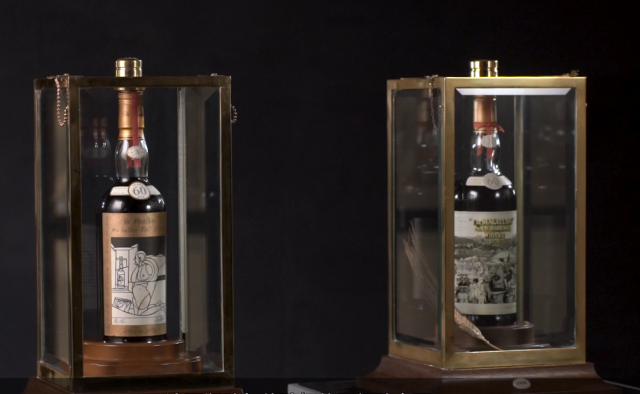 The two rare bottles of Macallan 1926 at the Bonhams’ Fine and Rare Wine and Whisky sale on 18 May were among the 24 bottles with labels commissioned by two of the 20th century’s renowned Pop Art artists, Sir Peter Blake and Italy’s Valerio Adami, making them highly sought-after among whisky collectors and art connoisseurs. “This is the right time in the right market for Macallan,” said Daniel Lam, Bonhams’ head of Fine Wine and Whisky in Hong Kong, while speaking to dbHK. Since Bonhams first ventured into whisky auctions in Hong Kong in 2009 – the first among auction houses – its whisky sales contribute about 80% of the total of Bonhams’ global whisky sales, with collectors from Japan, Taiwan and mainland China vying for rare bottles. Taiwan, a key whisky collecting market, has become the biggest consumer of whisky by value in the world, said Lam, and for the past year and a half, collectors in China have been active in the whisky scene. As a result, “they really pushed up prices for single malt whisky not just the famous brands but in every category,” he commented. But among all whisky brands, The Macallan has been a name that has consistently performed very well in every category, Lam stressed. According to Lam, the bottles were distilled at The Macallan Distillers in Craigellachie in 1926 and matured in Sherry casks for 60 years before being released in 1986 to offer as corporate gifts to the distillery’s most valued customers. Only 24 bottles – 12 of the Blake label and 12 of the Adami label – were produced. Adding to the bottles’ rarity, Lam revealed a few of the bottles have already been consumed, and one set was damaged in an earthquake in Japan. For a few collectors in Europe who were lucky to get their hands on the pair, the bottles were always “placed at the top of their prized collection,” as if crown jewels. The bottle with the Peter Blake label has the bottle number ‘8/12’ on its front label, indicating it’s the eighth bottle of the 12 bottles produced, while the Adami label on offer is the second bottle of the 12 bottles produced. Both bottles are signed by the respective artist and The Macallan chairman Allan Shiach. The Peter Blake label features prominent events that happened in the year of 1926 with a reference to Bobby Jones, the first golf player to win The Double, both the US and British Open Championships. Adami’s label is full of geometric lines typical of the artist but more interestingly, on the label design, the exact bottle of the Macallan 1926 with the Adami label is featured in the image. Alongside these exceptional bottles, the sale will present a total of 650 lots with 210 lots of wine and 440 lots of whisky. For more details about the two Macallans, you can click here to watch the video to learn more. These 1926 MACALLANS is really a collectors’ love.